NOOOOOOOOOO!!!! A few more changes to the Original Trilogy in the upcoming Blu-Ray release have been confirmed, including a new and kind of unnecessary "NO!" 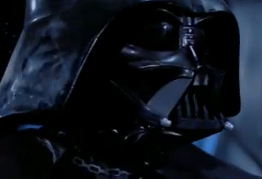 during Darth Vader's sacrifice in Return of the Jedi. Other rumored (we don't know for sure if they've been officially confirmed yet) changes include a Dug added to the crowd of aliens in Jabba's Palace, a new "thawing" effect during Han's release from the carbonite, and yet another version of Obi-Wan's krayt dragon yell in A New Hope that doesn't sound great. Some of these changes are nice but others don't seem very necessary and aren't being well received by fans. What do you think of the changes? Comment below or join the discussion on Facebook and let us know! Today we examine a re-sculpt that nobody seemed to want. 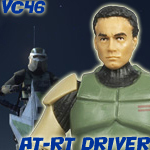 Should the Vintage Collection AT-RT Driver replace your old 2005 version? Read on to find out! 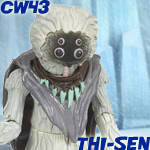 Echo Base News Reviews - CW48: Snowbi-Wan Kenobi! Coulda used some gear like this coming back from class today! 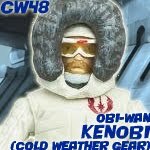 Today, Echo Base News looks at Snowbi-Wan Kenobi in Cold Weather Gear! Is Obi-Wan's one of few different costumes worth owning? Read on! Amidst the changes made to the Blu Ray, Star Wars Union posted a new change this afternoon... For those who don't speak German, click on the link that says "Pupillin." 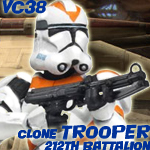 Today we take a look at the much-despised Clone Trooper (212th Battalion). While it's simply a repaint, is the hate warranted? Read on to find out! Double header for Clone Wars this weekend! Is this yet another figure you've never seen? Read about if it's worth the hype! Commander_Kurgan is in the Spotlight again with his latest awesome creation, Ty Kwinn! 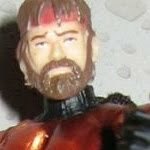 To check out this custom and its backstory click here to enter the forums and view the Commander's customizing thread. Our friends at Imperial Shipyards have passed along details of the latest charity auctions supporting the family of our old friend Mike Martinez, who tragically passed away last month. The latest item up for auction in their forums is the very cool mail-away Rocket-Firing Boba Fett figure. 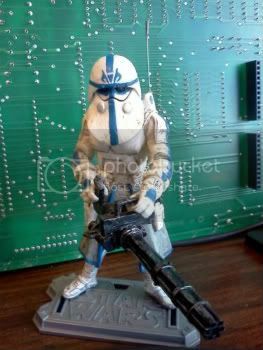 Also available on eBay is a fantastic custom McQuarrie Concept Captain Rex figure. 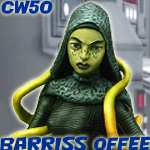 Head over to Imperial Shipyards today to check out the auctions and place your bids! 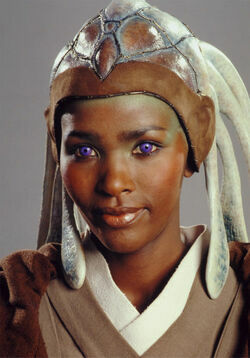 Today, I had the chance to interview Lily Nyamwasa, known better as Jedi Stass Allie! So....our schedule has been a little messed up. Why you ask? Blame Hurricane Irene! Looking for a review? We're gonna go a little out of order and give you this interesting resculpt instead of Vintage today. 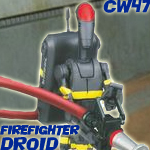 Is this pretty hard to find Firefighter Droid worth tracking down? Read on! Today we examine one of the rarities of The Vintage Collection. 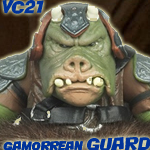 Read on to find out if the Gamorrean Guard is worth the premium price it commands on the secondary market! I have just interviewed Robert Hendrickson, who is a well known Star Wars artist. Read on and check it out! 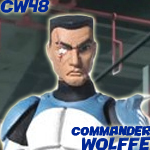 Echo Base News Reviews - CW48: Commander Wolffe! Today, we take a look at yet another Clone repaint with Commander Wolffe! Is yet another clone worth adding to your collection? Find out after the break! Footage has shown up on YouTube today of the CGI Yoda that will be replacing the original puppet used in Episode I for the upcoming Blu-Ray and 3D releases. Click here to check it out! You've got to see these amazing Clone Wars astromech droid repaints wraithnine is showing off in our customizing forums! There are a whole bunch of awesome designs and these paintjobs are fantastic! Click here to check it out. These are the droids you're looking for. There are a lot of other great Clone Wars customs as well, including the rest of Domino Squad. Celebration VI tickets on sale now! Celebration VI is less than a year away, and tickets are on sale now! Click here for all the details. 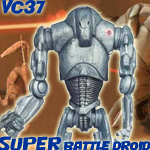 Echo Base News Reviews - VC37: Super Battle Droid! Today we begin reviewing some older figures from Hasbro's Vintage Collection, starting with the Super Battle Droid from 2011's Attack of the Clones-themed wave of figures. Is this figure more than a repaint? Read on to find out! 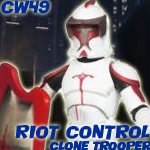 Echo Base News Reviews - CW49: Riot Control Clone Trooper! 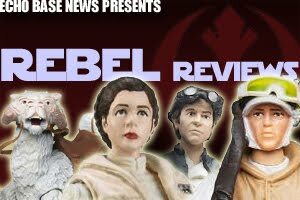 Eek...We're gonna have to stick this guy in the "Better Late Than Never" Category...Today, Echo Base News reviews the Riot Control Clone Trooper. 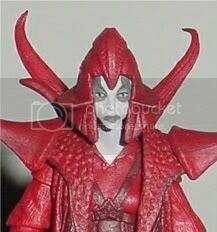 Is this also pretty rare figure worth adding to your collection? 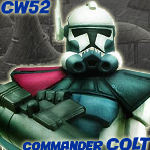 Today, Echo Base News reviews Commander Colt! Is this semi-repainted Clone Trooper worth the time, energy and money to track him down? Star Wars Blu-Ray special features and deleted scenes revealed! Our friends at Rebelscum have posted a breakdown of the special features and deleted scenes that will be included in Discs 7-9 of the upcoming Star Wars Blu-Ray release. There's some very interesting stuff for sure! Click here to check it out. 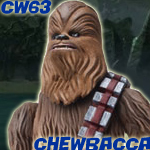 Echo Base News Reviews - CW63: Chewbacca! Today, Echo Base reviews Chewbacca! (This review is dedicated to Jenn ;)) Is the animated Wookiee worth your time and cash? Read on! The Clone Wars Season 4 Trailer - Battle Lines! 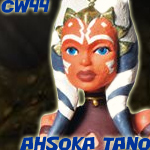 This new trailer from TCW Season 4 entitled, "Battle Lines" is a must see! Although there are a few scenes we've seen in previous trailers, there are some epic scenes that leave you hanging on the edge of your seat anxiously waiting for September 16th!!! Today's Spotlight is on Darth Daddy and his Gamorrean Gladiator! 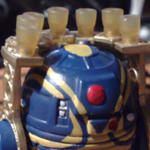 Inspired by customizers such as JACKOFTRADZE and Von Reinhardt, Darth Daddy didn't have the heart to cut up the rare gem known as TVC Gamorrean Guard. However he didn't mind doing a little surgery on the POTF version! Click here to see more and for the full story be sure to check out his blog, Customs for the Kid. 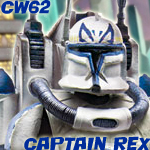 Today, Echo Base News takes a look at the new Captain Rex with jetpack! Is this new figure worth buying (in multiples to replace the old mold)? Read on! For Today's Spotlight I'm going back to the contest with our 3rd Place Winner, botwt and his Kyuzo Sith Lord! If you know botwt's work you know he creates superbly detailed, animation style figures and his entry for the contest was no different. I'm not a fan of Sith, but this guy is awesome and looks like he could change anyone's mind! To view all the entries from the contest click here, and stop by botwt's blog to view more of his work and get his Kyuzo Sith Lord Recipe! The final winner in The Great SW Customizing Challenge has been announced! Darth_sidious' custom Mother Talzin is the winner of The Great Star Wars Customizing Challenge! Click here to see the beauty that won the fan's votes and all the of the other great entries. Congratulations to darth_sidious, all the winners and participants, this was such an exciting contest! Bo shuda! Today we conclude our very special two-part interview that was months in the making. 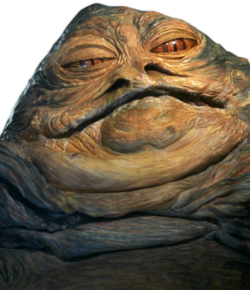 It's Part 2 of our interview with Jabba the Hutt! Well, not exactly, but it's the closest we could get. Chris and I were able to chat with a few of the amazingly talented puppeteers and sculptors that brought everyone's favorite loathsome slug to life in Return of the Jedi nearly thirty years ago. John Coppinger, Dave Barclay, and Toby Philpott have given us this incredible behind-the-scenes look at what went on inside the belly of the beast during the filming of Return of the Jedi and given us all the slimy details about how one of the most popular villains in film history was created. Here's Part 2. Enjoy! Also, click here to check out Part 1 if you need to catch up first. Washingtonian is in Today's Spotlight with his Wooden Star Wars Figures! I love how the wood gives them that antique toy feel and the detail is just great. To read how these unique figures were made click here, and to see more work by the Washingtonian just click here! The newest custom up for auction in The Mike Martinez Charity Auction is this phenomenal McQuarrie Concept Arctic Rex created by RunDown! You can buy it now for only $30.00, click here for more details. 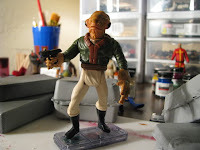 If you'd like to check out the other figures up for auction from customizers Incom, Speedless Customs, & Darth Daddy just click here! Today's Spotlight is on darth_sidious' entry from The Great Star wars Customizing Challenge, Mother Talzin. She is a wonderfully detailed figure and comes with a second set of hands for that Ultimate Creep Factor! Excellent job and you can see why darth_sidious is in the lead for 5th Place. If you haven't placed your vote for The Great Star Wars Customizing Challenge you have until 8/13/2011 at 5:48am. So click here to view all the entries, and then click here to cast your vote! 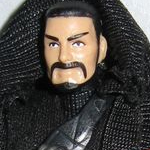 Commander Kurgan is at it again and in today's Spotlight once more! Master Norrs of the Imperial Knights was created with just a simple headswap, but he's still one of the baddest guys in town. You don't want to get on Norrs' bad side, so click here to check out more of Kurgan's work! 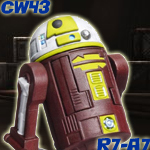 Today's reviews at Echo Base News includes Ahsoka Tano's astromech droid, R7-A7! Is this teeny little dude worth the asking price? Read on! 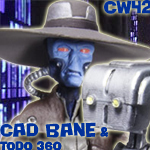 Today's reviews from Echo Base News includes a review of Cad Bane and TODO-360! The "two-pack" is a great value with a lot of fun! Read about it after the jump. Bo shuda! Today we have Part 1 of a very special two-part interview months in the making. It's an interview with Jabba the Hutt! Well, not exactly, but it's the closest we could get. Chris and I were able to chat with four of the amazingly talented puppeteers and sculptors that brought everyone's favorite loathsome slug to life in Return of the Jedi nearly thirty years ago. John Coppinger, Dave Barclay, Toby Philpott and Mike Quinn have given us an incredible behind-the-scenes look at what went on inside the belly of the beast during the filming of Return of the Jedi and given us all the slimy details about how one of the most popular villains in film history was created. Here's Part 1. Enjoy! Collectible Star Wars legal tender coins announced! New Zealand Mint passes along an announcement of a very cool new line of Star Wars coins! Read on for the full media release. "One of cinema’s most enduring and beloved franchises, the Star Wars Saga has made its imprint on books, TV, toys, soft goods, kitchen wares, video games, comic books and much, much more—but never as a legal tender coin set available in the U.S. Until now!" Vintage figures on sale at Toys R Us! Star Wars Vintage Collection figures are a part of the "2 for $10.99" action figure sale going on this week at Toys R Us stores. The sale doesn't seem to apply to Vintage Collection figures on the TRU website, but numerous reports have come in stating that the sale is effective at TRU brick & mortar locations. Your mileage may vary, but it might be worth a trip to your local store to get some cheap figures. Other lines covered by the sale are Star Wars Clone Wars and Saga Legends, Captain America, Thor, Spider Man, Marvel Universe, and GI Joe. The sale ends on Saturday. Happy hunting! HasbroToyShop.com is giving away a FREE Star Wars figure with any $10 Star Wars purchase! "Receive 1 Free STAR WARS action figure with any STAR WARS purchase of $10 or more available only through the HasbroToyShop.com website. Figures may vary. Offer valid in U.S. only. Offer expires August 22, 2011 at 11:59 PM (ET)." Click here to check out their selection. Echo Base News recently had a chance to chat with actor Chris Edgerly about voicing Eeth Koth in Season 2 of The Clone Wars! 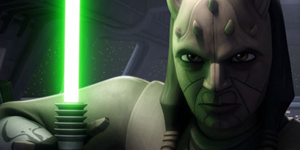 Click here to check out the interview to find out about his Star Wars experience and what's next for Eeth Koth in The Clone Wars! Forum member mrhoppers819 adds some more of his work to the Custom Threads! Click here to see more of his amazing work. 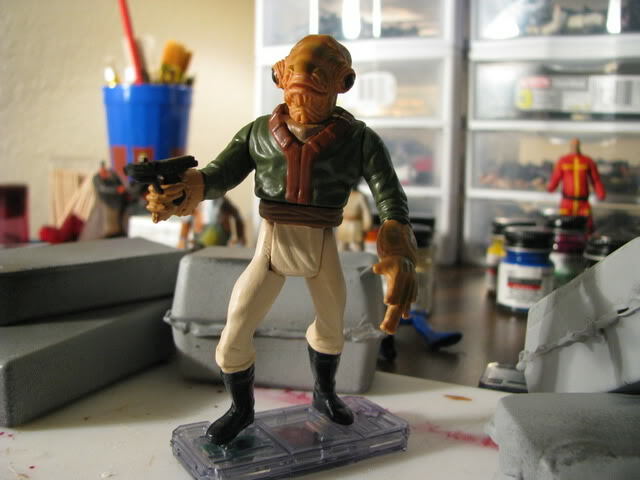 Today's Spotlight is on his Mon Cal Smuggler...I would so love to have one in my collection!!! Great job mrhoppers819. Darth Daddy wows us again with his Mandalorian Sith!!! Created as an entry for the Custom Sith Contest at Imperial Shipyards, this amazing custom will be auctioned off on the Mercury Art Studios Auction on ebay and is in today's Spotlight. To see more of this Mando Sith or to find more work from Darth Daddy, just click here to check out his thread.